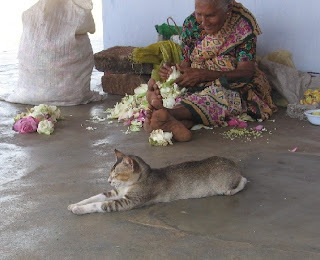 Nearly everywhere we travel, we manage to do some impromptu “cat tourism” and the pattern continued in Lanka; our guide was befuddled by the greater interest we showed in the feline-life than in the monuments and sculptures he was pointing out. The most impressive of the kitties we encountered was this little model of piety in the Ruwanvelisaya stupa complex in Anuradhapura. He/she remained in this position all the time we were there – arms stretched out in prayer, feet folded in a distinctly yogic posture. Didn’t move at all. I also like the expression on the woman's face. 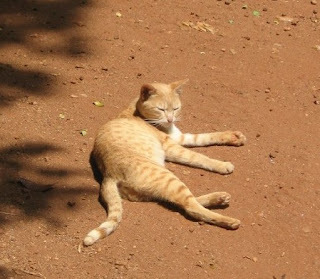 Another languid (but not as saintly) cat outside the Arunalu Spice and Herbal Garden, just before Kandy. Once we were done tickling this one’s belly, we dutifully spent some time inside the garden, admiring the plants, learning about the preparation of the very distinct curry powder that is used in nearly all Lankan cuisine. 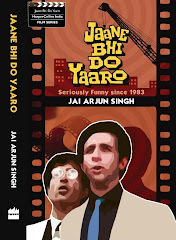 (The yellow daal was consistently excellent, though it isn’t for delicate stomachs.) Had some fine herbal tea too – very fresh, like all the tea and juices we had in the country. 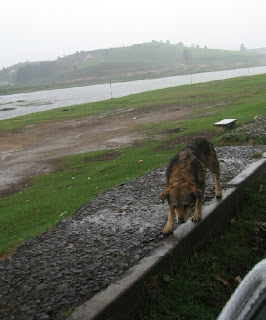 But still running with the animal theme: here’s a bedraggled mongrel on a cold and damp day in Nuwara Eliya. I was very taken by the topography of this place. Had thought it would be like a north Indian hill station, situated on a mountainside so that you have to negotiate steep and winding roads uphill or downhill even to travel just a few kilometers. 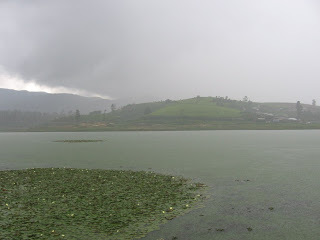 But Nuwara Eliya is on a plateau, so even though it’s 2,000 metres above sea level there are vast patches of flat land, including the area occupied by the lake you see in this photo. Much more relaxing on the whole for people who suffer from motion sickness on mountain roads. Some of the scenery also reminded me of the Scottish highlands; these photos don't really do it justice. 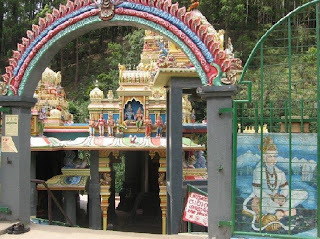 Hanuman temple in Nuwara Eliya. The people who built it claim this was the spot where Sita was kept captive by Ravana, and where Hanuman found her. 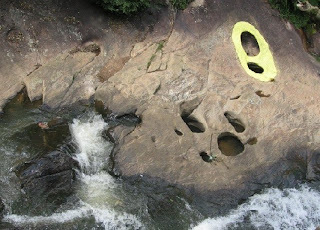 Naturally, this means that they have a spot on one of the rocks marked with yellow to show that this was the indent left by the deity's giant foot when he landed here. 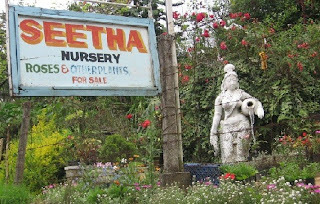 Next to the temple, there's a flower nursery dedicated to the abducted goddess, with her name spelt very differently from the north Indian style. 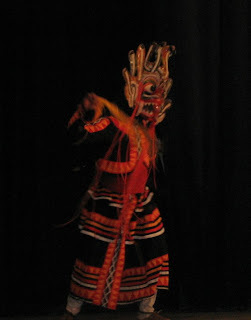 One of the performers in the mask dance, part of a cultural show we saw at the Kandy Arts Association Hall. Picked up a few of these masks later. 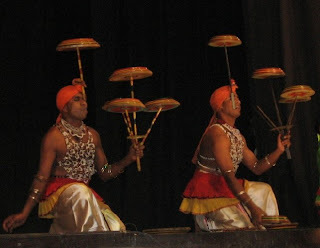 And the Raban dance, which involves the balancing of several spinning drums. Very impressive. Apologies for the picture quality though - dark hall, poor vantage point. 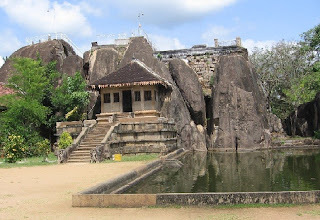 The ancient capital of Anuradhapura is full of old buildings and ruins, not all of which seem very well-maintained. We had a decent enough time there but it could have been better: we were there at the hottest time of day, there was very little shade and lots of walking to be done, much of it barefoot. 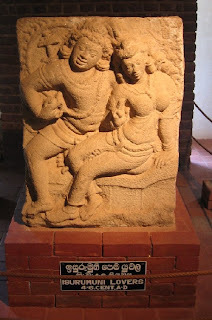 This is the Isurumuniya temple, dating from the 5th century, along with a famous carving of forbidden lovers. 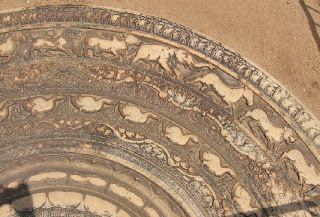 Also from Anuradhapura: a section of the semi-circular moonstone in the Abhayagiri monastery, with its motifs of buffaloes, lions, horses and elephants - some say the animals stand for the four stages of life, though there are other interpretations too. 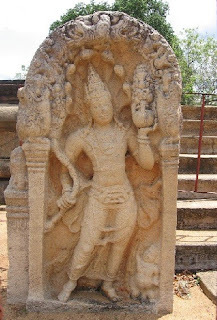 Also, a guardstone, with the guard carrying a pot of plenty, representing prosperity and fertility. More pics to follow, including several that involve elephants. Lovely cats and other photographs. Is the masala you mentioned also known as bottle masala? Nice pics mate. How is the weather out there in Lanka ? BTW, what digcam you used ? Lekhni: So that's why the sign said Hhanuman Themple! Dipali: it's curry powder, made of six spices - cinnamon, cumin seeds, aniseed, curry patta, cardamom and coriander. Don't know if it's called something else. Krishnan: it's a Canon 4 mega-pixels - I need to upgrade soon. Weather is mostly warm and a little humid, except in Nuwara Eliya where it was cool. Kandy was pleasant too, though it isn't very high. I imagine the coastal parts would have been extremely humid this time of year - one reason why we didn't go there.